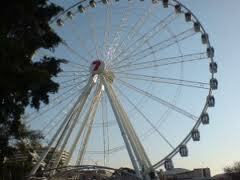 The most exciting way to see the entire North Myrtle Beach landscape is the new SkyWheel Myrtle Beach recently opened. 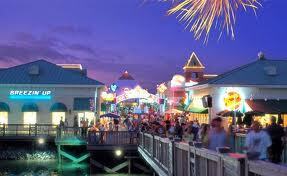 It’s located on the northern end of the 1.2 mile-long Oceanfront Boardwalk and Promenade. The boardwalk traverses from 14th Avenue to the 2nd Avenue pier, and presents its visitors with wonderful shops, great eateries and a breathtaking view of the pristine, sugary white Atlantic beach. The SkyWheel Myrtle Beach has 42 fully-enclosed gondolas that feature UV protective, non-reflective blue glass for excellent viewing and photo or video capturing; a neutral sand-colored interior with bench seating and intercom system. Each gondola will be climate-controlled year-round and can comfortably seat up to six passengers. The SkyWheel will also have one VIP gondola which will feature these same amenities in addition to a glass floor and leather bucket seating. The approximate 12-minute ride on SkyWheel Myrtle Beach will provide guests with a panoramic view, from the Myrtle Beach shoreline to North Myrtle Beach and several miles inland. It will serve as the perfect vantage point for the Grand Strand and a variety of different perspectives of the Myrtle Beach area creating the area’s most unique sightseeing opportunity. A highlight of the SkyWheel Myrtle Beach will be a state-of-the-art computer-generated lighting system with over one million LED lights, creating an amazing light show each evening after sunset. A variety of dynamic light shows will run nightly so you’ll have to check it out! SkyWheel Myrtle Beach features different flight options to choose from including general admission flights and the VIP gondola. General admission flights are $12 for adults (ages 12-64) and $8 for children (ages 3-11). Seniors (65+) and military (with valid ID) are discounted by $2 off the price of an adult ticket, and children two years-of-age and under are free. If you’re in town don’t miss the Sounds of Summer Concert Series on September 16 in McLean Park, North Myrtle Beach. From 7-9 p.m. listen to the Fantastic Shakers (Beach).